Angie was beautiful. What an interesting encounter with the medium. We'd like to believe that she made contact with Angie for you. Wow, that was wild that the psychic said Angie's name before you even said anything! I am sure that Angie did send you a message through the medium. I truly believe that our beloved pets are still with us watching over us after their passing. That is a beautiful picture of Angie. 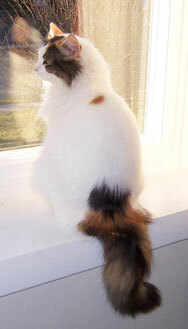 We always loved Angie's pretty tail and you did amazing photos of your babies. I believe, Honey Sunshine has visited me in a very vivid dream a few weeks after she died and I think that she hangs out in our living room on occasion with me and Gidget. there is one spot up high on one particular wall above the left side of the top of the sofa where Gidget will watch on occasion and there is nothing there. I always tell her that it must be Honey's spirit flying around the living room, it has happened about half a dozen times now. I also feel Honey climbing around on my bed when I am in it and Gidget is sleeping in the living room, Honey was so much more light footed and my chunky gymnast Gidget. I talk to Honey when I feel her around. you just have to be more open to it and take time to recognize certain signs. Usually we humans are so pre-occupied with so much other mental chatter and such. Blogger just ate our comment! On so many levels I think that their spirits are closer to the light of righteousness than our own human frailties, so I believe they are with us right beyond the veil. What a beautiful photo of Angie and I'm glad you'll be doing a book of them. I sure do miss that Beau Beau too.